In the FP-5200 sensor housing, a magnet is surrounded by a coil, creating a magnetic field. As the liquid flow causes the rotor to spin, each blade passing this coil concentrates the lines of magnetic force, producing a repeatable AC sine wave output. The FP-5200 also features OMEGA’s patented "open-cell" rotor, for increased linearity at ±1% over the full dynamic range of 1.6 to 20 fps, with negligible head loss. The FP-5200 is completely compatible with FPM Series powered flow indicators, controllers, and totalizers, to give increased flexibility in system design. It also interfaces easily with digital computers and with a variety of other external equipment. When you're looking for the added strength of an all-metal flow sensor, make it the FP-5200. It permits the high degree of accuracy and reliability you demand, without added cost. Compare it to traditional metal flowmeters, where the price increases dramatically with pipe size. In contrast, you can install the FP-5200 insertion flow sensor in pipe sizes ranging from ½ to 12" without a lot of additional cost, because the sensor price increases only slightly for larger pipe sizes. Furthermore, it's accurate to ±1% of full scale. Installation is easy. Use the FP-5200 locally, or in a remote area up to 100 feet from the meter or controller without signal amplification. It needs no external power or battery. Just one operator, simple tools, an FP-5200 Flow Sensor, a few minutes . . . and you're on-line. 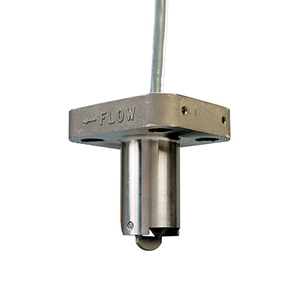 Additionally, the all-stainless-steel flow sensor accurately measures a wide variety of fluids, even under high pressure and temperature conditions [pressures up to 1500 psi, temperatures up to 150°C (300°F)]. Size ½" ¾" 1" 1¼" 1½" 2" 2½" 3" 4" 5" 6" 8" 10" 12"
The metal hot-tap sensor allows the user easy sensor installation and removal without shutting down the process stream. Compatible with Mueller drill assemblies, this new hot-tap sensor can be quickly installed into pipe sizes from 1½ to 24". This hot-tap assembly is compatible with any 1½ NPT female pipe fitting such as weldolets and saddles. Installation fitting not supplied.